Can You Walk From Brooklyn to Staten Island on Verrazano Bridge? Once a year, at the start of the annual New York City Marathon, thousands of runners mass on the beautiful Verrazano Bridge connecting Brooklyn and Staten Island. But, the bridge isn't usually open to the public, however. There are no pedestrian walkways on the Verrazano-Narrows Bridge connecting Brooklyn and Staten Island. The Verrazano-Narrows Bridge only has lanes for cars, and it's a busy, fast thoroughfare. This bridge is open to bikers, walkers or cyclists only on special occasions such as the New York City Marathon and the Five Boro Bike Tour. Although there have been discussions and a rally about adding a bike and walkway on the bridge, there isn't one yet. 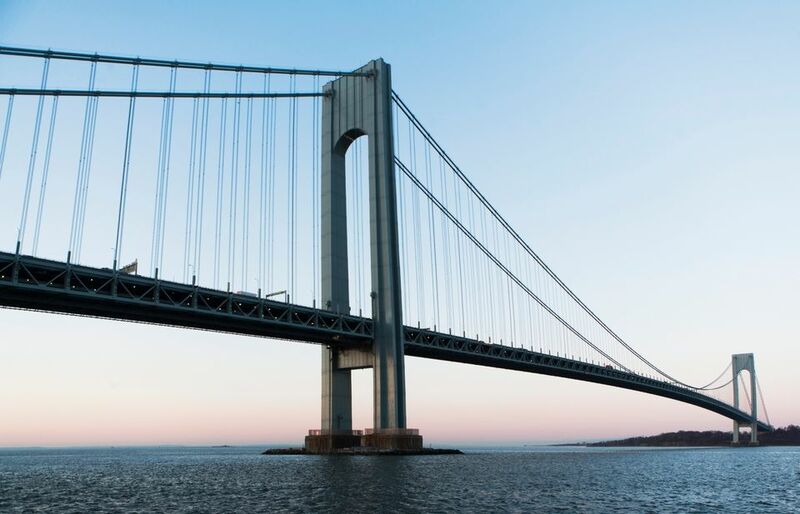 If you'd like to walk near the bridge, you can always run or cycle on the Shore Park and Parkway path with views of the Verrazano Bridge, as well as the Statue of Liberty and Coney Island. Afterward explore the streets of Bay Ridge, home to numerous restaurants, bars, and incredible shopping. However if you'd like to walk across another bridge in Brooklyn, you can. There are three bridges you can walk across in Brooklyn. Of course none of these end in Staten Island. You can walk to Manhattan on these bridges. Or you can cycle across these bridges, since they all have access for both pedestrians and cyclists. On the Williamsburg Bridge, pedestrians have their own walkway. In Brooklyn, enter at Berry Street between South 5th and South 6th Streets. Cyclists enter a few blocks east, at Washington Plaza (Roebling and South 4th Streets). Though you may be tempted to enter wherever it's most convenient, please don't. Cyclists travel fast and it's very dangerous for pedestrians. The Manhattan Bridge, a turn-of-the-century suspension bridge, has a pedestrian path. Enter on Sands and Jay Street if you want to walk across the bridge. If you've gotten your CitiBike for the day and want to cycle across the bridge, you enter at stairs at Jay & Sands Sts near High St, which is the former pedestrian path. The bridge ends in Manhattan's Chinatown neighborhood, some blocks north of where the Brooklyn Bridge hits Manhattan at City Hall. The Manhattan Bridge is usually much less crowded on weekends and holidays than the Brooklyn Bridge and is a great way to make your way into Chinatown. How do you get back? Walkers enter at Forsyth & Canal Streets, using the former bike path. Cyclists enter at Bowery via Division St detour, again using the former pedestrian path. You can't go to New York City and not walk across the iconic Brooklyn Bridge. The Brooklyn Bridge Pedestrian Walk can be accessed on the Brooklyn side from two entrance ways. The Brooklyn Bridge Pedestrian Walkway begins at the intersection of Tillary Street and Boerum Place. This entrance is what one sees from a car when crossing the Brooklyn Bridge. The second way to get onto the Brooklyn Bridge Pedestrian Walkway is to access it via an underpass on Washington Street. The underpass is about two blocks from Front Street in Brooklyn. This underpass leads up a stairway to a ramp up that brings you onto the Brooklyn Bridge Pedestrian Walkway. These bridges are a fun way to stay fit and see the city. If you've ever wanted to run inside the Brooklyn Battery Tunnel, you can participate in the annual Tunnel to Tower run. The race which was started in 2002 by the Siller Family in memory of Stephen Siller, an off duty firefighter who selflessly ran through the tunnel with sixty pounds of gear on 9/11 to help and tragically lost his life. The Tunnel to Towers foundation supports first responders and injured service members. Walk Across The Brooklyn Bridge With These Tips!